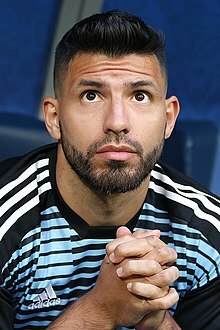 Sergio Leonel Agüero (Spanish pronunciation: ; born 2 June 1988) is an Argentine professional footballer who plays as a striker for Premier League club Manchester City and the Argentine national team. Agüero began his career at Independiente. On 5 July 2003, he became the youngest player to play in the Argentine Primera División on his debut at 15 years and 35 days, breaking the record previously established by Diego Maradona in 1976. In 2006, he moved to Europe to play for La Liga side Atlético Madrid, for a transfer fee of €23 million and made a name for himself, attracting attention from Europe's top clubs by scoring 101 goals in 234 appearances while winning the UEFA Europa League and the UEFA Super Cup in 2010. Agüero moved to Premier League club Manchester City in July 2011 for an undisclosed fee thought to be in the region of £35 million. On the last day of his debut season with the club, he scored a 94th-minute winner against Queens Park Rangers that earned City its first league title in 44 years. At the end of the 2015–16 season, of players who had played at least two seasons in the Premier League, Agüero had the highest goals per minute ratio in the history of the competition since its formation in 1992, averaging a goal every 106 minutes, ahead of Thierry Henry. He also holds the joint-record for the most goals scored in a single Premier League match – five – and the fastest to do so, in 23 minutes and 34 seconds of match time. In November 2017, Agüero became Manchester City's all-time highest goal-scorer, scoring his 178th City goal against Napoli. Agüero is currently the 8th highest goalscorer in Premier League history, and the highest non-European scorer in the history of the Premier League, with over 100 goals in the division. Sergio Agüero joined the youth system of Independiente at the age of nine. He started playing for the side, becoming the youngest player to debut in the division at 15 years and 35 days (on 5 July 2003 against Club Atlético San Lorenzo de Almagro), when Independiente's coach, Oscar Ruggeri sent Agüero onto the field as a substitute for Emanuel Rivas in the 69th minute of the match. His performance was well received by the press. Despite his early debut, he was not selected again by Ruggeri, and his replacement Osvaldo Sosa, for the remainder of 2002–03 season, having made only one appearance in the Torneo Clausura. Following the arrival of coach Jose Omar Pastoriza, seven months after Agüero's first match he returned to the club's first-team in 4–2 win against Peru's Cienciano during the group stages of the 2004 Copa Libertadores. This meant that he also became the youngest player to participate in the Copa Libertadores, a record that he held for three years. One month later, Agüero again featured in a Copa Libertadores fixture against Ecuador's El Nacional. On 19 June, for the first time, Agüero played a full 90-minute match for Independiente against Atlético de Rafaela during the Torneo Clausura. He scored his first goal for Independiente in a 2–2 draw against Estudiantes on 26 November, with a 22nd minute shot from outside the penalty area. Agüero became a regular in the club's first-team, being selected for the Argentina U-20 squad for the 2005 FIFA U-20 World Cup, which Argentina won. During the 2005–06 season, Agüero scored 18 goals in 36 league appearances, having missed two games due to suspension. In a 4–0 win against Racing on 11 September, he dribbled from inside of his own half and scored Independiente's fourth goal with a left footed shot. His first red card came in the Torneo Apertura, after slapping an opponent in a match against Tiro Federal. His outstanding performances during the Torneo Apertura attracted interest from a number of large European clubs, and, after months of speculation, Agüero announced on TV in April that he intended to leave the club at the end of the season. Before the end of the season, there had already been speculation of a possible transfer to Atlético Madrid. With his performances being lauded by the press, there was talk of a possible call up for Agüero for the 2006 FIFA World Cup. In a 2–0 away victory against Olimpo de Bahia Blanca in round 17 of the Torneo Clausura, Agüero received his fifth yellow card of the season. This prevented him from playing his last game for Independiente in a fixture against Boca Juniors in Avellaneda one week later. The yellow card brought tears to his eyes, as television cameras recorded. Agüero, who scored Independiente's second goal of the match later said "I think that it was my last goal for Independiente". He played his last game for Independiente, two weeks later, in a 2–0 away defeat to Rosario Central. On 30 May, Agüero officially transferred to Atlético Madrid for €20 million, marking a record for the club. In May 2006, Agüero joined Spanish club Atlético Madrid for a fee reported to be around €20 million, breaking the club's previous transfer record. He caused controversy early in his Atlético career by using his hands to score the winning goal against Recreativo de Huelva on 14 October 2006, only his second goal for the club, with the first coming in a 4–1 away win against Athletic Bilbao on 17 September. He ended his first season in Madrid with seven goals in all competitions, eased into European football by manager Javier Aguirre, who opted to bring him in and out of the line-up as Atlético finished seventh, enough to qualify for the UEFA Intertoto Cup. Following the departure of strike partner Fernando Torres to Liverpool in the summer of 2007, Agüero secured his starting spot for the Rojiblancos and soon became arguably the team's most important player at the age of just 19. In the 2007–08 season, he finished third highest scorer in La Liga, behind Daniel Güiza and Luís Fabiano, with 19 goals, and was runner up in the Trofeo Alfredo Di Stéfano award. Agüero won many plaudits for his man of the match display against Barcelona in March 2008, scoring twice, assisting a goal and winning a penalty for Atlético in a 4–2 win. He also scored important goals against the likes of Real Madrid, Valencia, Sevilla and Villarreal to help Atlético finish fourth and qualify for the UEFA Champions League for the first time in over ten years. On 23 May 2011, Agüero announced on his official website that he wanted to move from Atlético and formally asked to be released from his contract. Agüero later spoke to ESPN, where he stated that he would "not be returning to Atlético". On the same day that Agüero officially became a Manchester City player, Atlético hosted a 2011–12 Europa League qualifier against Strømsgodset IF, where a group of Atlético fans brandished "Agüero, We Hope You Die" banners in a reaction to the striker's transfer to City at the Vicente Calderón on 28 July 2011, after he had previously stated his desire to see out his contract with the club just weeks before requesting a transfer. Upon his departure, Atlético used the money from Agüero's sale to buy Radamel Falcao as his replacement. On 28 July 2011, Manchester City confirmed that Agüero had signed a five-year contract with the club. The fee was reported to be in the region of £35 million. He was given the number 16 shirt for his first season at City and wears the shirt name Kun Agüero. He was an unused substitute in the Dublin Super Cup match against Internazionale and the 2011 FA Community Shield against Manchester United with manager Roberto Mancini believing Agüero was not yet fit. Agüero made his debut for City on 15 August 2011 in a 4–0 Premier League victory over Swansea City. Agüero came on as a substitute in the 59th minute, scoring his first goal for the club within nine minutes after a tap-in from a cross from full back Micah Richards. He then turned provider with an assist after chipping over the oncoming goalkeeper before flicking the ball back into the penalty box and into the path of David Silva to score. Agüero rounded off his debut by scoring again in injury time with a 30-yard strike. His 30-minute debut gained rave reviews among football journalists, with some suggesting it was one of the best in English football. City continued their strong start, winning 3–2 away at Bolton Wanderers with Agüero missing two chances in the penalty box. On 28 August, Agüero scored his third league goal in Manchester City's 5–1 rout of Tottenham Hotspur. On his third start for the club, he scored his first Premier League hat-trick, against Wigan Athletic. On 18 September, he scored twice at Craven Cottage against Fulham, but City were held to a 2–2 draw. Having been substituted after just 28 minutes due to an injury during a 4–0 win against Blackburn Rovers on 1 October, Agüero returned to action in a 2011–12 UEFA Champions League group stage fixture, where he came on for Nigel de Jong on 62 minutes and scored a 93rd-minute winner in his side's 2–1 victory against Villarreal on 18 October. On 23 October, Agüero took part in his first Manchester derby, scoring in the 69th minute as he converted a Micah Richards pass across the face of goal. The match finished 6–1 to City. On 1 November, Agüero was shortlisted for the prestigious FIFA Ballon d'Or. On 19 November, he scored a penalty in a 3–1 win at home to Newcastle United, ending Newcastle's unbeaten start to the season. Agüero made his League Cup debut in the quarter final match against Arsenal at the Emirates Stadium, scoring the only goal of the game in the 83rd minute from an Adam Johnson through-ball. His next goal came in a 5–1 home win against Norwich City, opening the scoring in the 32nd minute, giving him his 13th goal of the season and maintaining the team's 100% league record at home. On 21 December, he scored a brace as City beat Stoke City 3–0 at home. On 3 January 2012, he opened the scoring in a 3–0 win at home to Liverpool, beating Pepe Reina with a low shot. Agüero scored his 15th goal on 4 February, scoring a penalty against Fulham in a 3–0 win at a snow-covered City of Manchester Stadium. During the first-leg of a Europa League round of 32 match against Porto, Agüero entered the field in the 78th minute for Mario Balotelli and scored the match-winning goal, and his first Europa League goal for Manchester City, in the 85th minute. The game ended 2–1, and, in the second-leg, Agüero scored within 19 seconds in a 4–0 win on 22 February. Manchester City advanced to the last 16 of the 2011–12 UEFA Europa League, having won 6–1 on aggregate. On 25 February, Agüero scored his 16th league goal in a 3–0 win against Blackburn. During the second-leg of Manchester City's Round of 16 Europa League fixture against Sporting CP on 15 March, Agüero netted a double to help City claim a 3–2 win, having been trailing 2–0 at half-time, to level the scores at 3–3 on aggregate. Sporting CP won on away goals, as they defeated Manchester City 1–0 in the first-leg on 8 March. One week later, Agüero scored his 17th league goal in 2–1 win against Chelsea on 21 March. On 29 March, Agüero was ruled out for 10 days to two weeks due to a foot problem, which was later diagnosed as a reaction to a substance that blistered his foot. On 11 April, Agüero scored two goals for himself and also set up another two goals (for David Silva and Carlos Tevez) in a 4–0 home victory against West Bromwich Albion. On 14 April, Agüero scored a double in a 6–1 away win against Norwich City, his two goals meaning that he had surpassed 20 league goals in the Premier League. He scored one goal in the next match, in which Manchester City beat Wolverhampton Wanderers 2–0. On 4 May, Agüero was named Manchester City Player of The Year. His first goal in the 6–1 away win against Norwich also won him the club's Goal of the Season award. Five straight wins helped City wipe out the eight-point deficit against United, and they went into the final day's fixtures leading on goal difference. Facing relegation-threatened Queens Park Rangers, City needed to match or better United's result at Sunderland. By the 66th minute, QPR's Joey Barton was sent off after elbowing Agüero's teammate, Carlos Tevez in the face. Eventually after being shown the red card, Barton proceeded to kick Agüero's knee, then attempted to attack Vincent Kompany, only for him to be held back by Micah Richards. Despite that, QPR still went ahead 2–1 against City, while United were 1–0 up against Sunderland. In response, manager Roberto Mancini sent on strikers Edin Džeko and Mario Balotelli in an attempt to get the two goals City now needed for the title. Five minutes of injury time began for City with their and United's match scores still constant. Džeko equalised for City for a glimmer of hope, but United soon finished their own game with a victory. In the 94th minute, Agüero, receiving the ball from Balotelli, drove into the penalty area and placed a powerful low shot into the corner of the goal, clinching the win and the title for Manchester City. Agüero's goal sent the City of Manchester Stadium into a frenzy and he was dragged to the floor jubilantly by his City teammates. Vincent Kompany recalled that Agüero was crying on the floor, and when asked if he cried during the Manchester City parade the following day, Agüero stated: "Yeah, a little". Agüero started the 2012–13 season in the 2012 FA Community Shield against Chelsea at Villa Park as Manchester City won 3–2. In Manchester City's first league match, Agüero had to be stretchered off in the 13th minute of their home game against Southampton due to a knee injury. Agüero was an unused substitute in City's 3–2 defeat to Real Madrid on 18 September 2012. Following the match, Agüero said he would have joined Real Madrid had they made an offer for him in 2011 but was left with "no option but to join City". Agüero made his return in a 1–1 home draw against Arsenal in the Premier League and went on to score his first goal of the season against Fulham on 29 September in a 2–1 away win in the Premier League. He followed this up with another goal the following weekend against Sunderland in a 3–0 home win. His next league goal came in a 2–1 win at home against Tottenham on 11 November. He followed this up with another two goals the following weekend against Aston Villa in a 5–0 win at home. Agüero also scored in back-to-back games in the Champions League in successive draws at home to Ajax and Real Madrid. He scored his next goal on 15 December, where he scored the opening goal, as Manchester City won 3–1 away against Newcastle. Agüero then scored against Norwich City on 29 December in a 4–3 away win. In his next match on 2 January, after scoring a penalty in the 73rd minute, Agüero damaged his hamstring during a 3–0 victory over Stoke. Agüero made his return for Manchester City on 19 January after coming on as an 81st-minute substitute in a 2–0 victory against Fulham. On 3 February, Agüero scored the equaliser after beating Liverpool goalkeeper Pepe Reina in a race to the ball out near the right corner flag. On 17 February, Agüero helped Manchester City to the quarter-finals of the FA Cup as he scored twice in a 4–0 win at home to Leeds United. He sustained a knee injury in the 2–0 win over Chelsea on 24 February. This eventually led to him missing the Argentina squad for the 2014 FIFA World Cup qualification matches against Venezuela and Bolivia. Agüero made his return for Manchester City on 30 March after coming on as a substitute with warm reception in a 4–0 victory against Newcastle. On 8 April, Agüero scored a solo goal to give City the win in the Manchester derby in the 78th minute, seven minutes after coming on as a substitute for Samir Nasri. Agüero then scored a header to help Manchester City defeat Chelsea on 14 April in the FA Cup semi-final and reach the final. In the 82nd-minute of the tie, Agüero made a two-footed tackle on David Luiz after the defender had previously appeared to tackle him. Despite the incident warranting a red card at the time, the FA announced Agüero would not be punished following confirmation that referee Chris Foy had at least seen part of the incident and acted on it during the match. Many people disagreed with this decision and felt that the FA had failed to act. On 17 April, Agüero revealed that he had apologised to David Luiz for his rash challenge on the defender. Agüero withdrew as a precaution at half-time on 17 April in Manchester City's 1–0 home victory over Wigan after feeling tightness in a hamstring, but he appeared as an unused substitute in City's 3–1 away loss at White Hart Lane against Tottenham on 21 April. He scored his next goal on 27 April, where he scored the opening goal, as Manchester City won 2–1 home against West Ham United. On 11 May, Agüero started for Manchester City in the 2013 FA Cup Final, where the team lost 1–0 to Wigan. Agüero scored his final goal of the season in a 2–0 away win against Reading on 14 May. The Times reported that he was the main transfer target of Spanish giants Real Madrid, but Agüero responded by saying, "I'm very happy at City and I feel appreciated and loved here which means a lot to me." Manchester City chief executive Ferran Soriano also negated the idea of a transfer, insisting Agüero would stay at the City of Manchester Stadium. However, former Argentina international Diego Maradona backed him to join Real Madrid, believing Agüero's presence in the Madrid team could help get even more out of Cristiano Ronaldo. On 25 May 2013, Agüero signed a one-year extension to his contract, keeping him at Manchester City until 2017. Agüero stated his commitment to Manchester City on 28 May 2013, saying, "I'm committed to Manchester City, it's a great club." On 14 December 2013, Agüero was substituted in a 6–3 win against Arsenal due to a calf injury and missed eight matches. On 16 January 2014, he returned from injury in an FA Cup third-round replay against Blackburn Rovers, scoring after coming on as a substitute in the 5–0 win. In the next round of the competition, he scored his first hat-trick of the season in a 4–2 victory over Watford. On 29 January, he scored his 50th Premier League goal in a 5–1 victory at Tottenham but was substituted with a hamstring injury. On 21 April 2014, Agüero scored his first goal since January in a 3–1 defeat of West Bromwich Albion at the City of Manchester Stadium. After scoring his final goal of the season in a 3–2 win over Everton at Goodison Park on 3 May, Agüero started for Manchester City against West Ham as the team secured its second Premier League title in three seasons with a 2–0 win. On 14 August 2014, Agüero signed a new five-year contract to keep him at Manchester City until 2019. Agüero scored his first goal of 2014–15 while appearing as an 83rd-minute substitute for Edin Džeko in City's opening match of the Premier League season against Newcastle on 17 August. Due to his late return from the World Cup, Agüero was again used as a substitute in the second game of the season against Liverpool, but, after replacing Džeko, took just 23 seconds to score City's third goal in the 3–1 win. On 18 October 2014, he scored all four of City's goals in a 4–1 home win over Tottenham, two of which were penalties; he took another penalty in the match, but it was saved by Hugo Lloris. This took Agüero to 61 Premier League goals for the club, surpassing Carlos Tevez as the club's record scorer in the competition. He was the first player in the season to reach ten Premier League goals, doing so with the only goal in the Manchester derby on 2 November. Agüero scored a hat-trick in City's 3–2 win over Bayern Munich in the Champions League group stage on 25 November, starting with a penalty which he won himself. Five days later, in his 100th Premier League match, he was wrongly booked for simulation by referee Mike Jones after being fouled by José Fonte in the penalty area, although City went on to defeat Southampton 3–0. On 7 August 2015, Agüero announced he would be switching from his number 16 shirt to the number 10 shirt, previously worn by teammate Edin Džeko. Nine days later, he opened the scoring in a 3–0 home victory over reigning champions Chelsea. On 3 October, Agüero scored five goals against Newcastle in a 6–1 comeback win, joining Andy Cole, Alan Shearer, Jermain Defoe and Dimitar Berbatov in scoring as many in a Premier League game. His five goals within 23 minutes of game time made it the fastest five-goal haul since the Premier League started in 1992. Four minutes after scoring his fifth goal in the 62nd minute, Agüero was substituted by manager Manuel Pellegrini, as he had been receiving treatment due to a leg injury at half time. On 8 October, in a 2018 World Cup qualifying match against Ecuador, Agüero sustained a hamstring injury early on and was carried off the pitch in tears. Agüero himself said he expected to be out for around four weeks (in which the derby against Manchester United was to be played), although several media outlets later claimed the injury would last for eight weeks. He returned on 21 November, scoring in a 1–4 home loss to Liverpool; this was his 85th Premier League goal, making him the top-scoring South American of all time in the division, ahead of his compatriot and former strike partner Carlos Tevez. On 16 April 2016, Agüero scored a hat-trick in a 3–0 win at Chelsea, ending with a penalty kick. He became the third visiting player to score a Premier League hat-trick at Stamford Bridge, and the fifth player to have three 20-goal seasons in the division. Three days later, he scored his 100th Premier League goal in a 1–1 draw at Newcastle. He reached the century in 147 games, second only to Alan Shearer who did so in 124. The goal was also Agüero's sixth against Newcastle for the season, making his just the sixth player in the Premier League era to have scored six goals against the same club in a single campaign. Agüero ended the 2015–16 Premier League season with 24 goals, one behind Golden Boot winner Harry Kane and level with Jamie Vardy. However, with his goals coming from 30 appearances, Agüero recorded the league's best goals to minute ratio. On 13 August 2016, Agüero scored Manchester City's first competitive goal under the management of Pep Guardiola in a 2–1 victory against Sunderland on the opening day of the 2016–17 Premier League season. In a league match against West Ham on 28 August, Agüero struck opponent Winston Reid in the throat with his arm, an incident which went unpunished by the referee. Reid lost his voice with the strike, and had to be substituted. The FA gave Agüero a three-match ban for violent conduct, accusing him of behaving in an "aggressive manner that was excessive in force and brutal". On 5 November 2016, Agüero scored his 150th goal for Manchester City in a 1–1 draw against Middlesbrough in the league. Agüero was sent off in a 1–3 loss to Chelsea on 3 December for a tackle on David Luiz and was given a four-match suspension. "He's a legend, and it's a part of history in the club. Aguero's numbers speak for themselves – he is amazing." — Manchester City Manager Pep Guardiola on Agüero after he scored a hat-trick against Watford, putting him two goals away from becoming club record scorer. Having scored on Manchester City's opening fixture of the season against Brighton & Hove Albion on 12 August, Agüero scored his second goal of the season against Liverpool in a 5–0 win on 9 September. This was his 124th Premier League goal, and saw him overtake Trinidadian Dwight Yorke as the top-scoring non-European in the competition's history. One week later, Agüero scored his sixth Premier League hat-trick in a 6–0 win at Watford to put Manchester City top of the league. On 28 September, Agüero was involved in a road accident after attending a Maluma concert in Amsterdam, when his taxi crashed into a lamppost. He was left with a fractured rib and ruled out for two weeks. On 21 October, Agüero scored his 177th goal for Manchester City in a 3–0 win over Burnley, equalling the record set by Eric Brook. This was also the Citizens 11th straight win, equalling another club record. He scored his record 178th goal for the team on 1 November away at Napoli in a Champions League group game, a 4–2 win that sent his team through to the knockout stages of the competition. On 20 January, Agüero scored his second hat-trick of the season against Newcastle in a 3–1 win, his second goal being the landmark 350th goal of his career. He was later awarded the Premier League Player of the Month for January, claiming the award for the fifth time in his career. On 10 February, Agüero scored four goals in a 5–1 Premier League home thrashing of Leicester City, claiming his third hat-trick of the season. He opened the scoring in the 2018 EFL Cup Final on 25 February, by chipping Arsenal's David Ospina in a 1vs1 situation, ultimately helping City secure a convincing 3–0 victory at Wembley Stadium. In City's first game of the season, Agüero scored both goals in the 2–0 2018 FA Community Shield victory over Chelsea, the first goal being his 200th for the club. On 19 August 2018, Agüero scored his 9th Premier League hat-trick in a 6–1 home victory against Huddersfield Town, putting him behind only Alan Shearer's 11. He also leapfrogged Robin van Persie to enter the league's top ten scorers of all time, and second place in foreign Premier League scorers only to Thierry Henry's 175. Agüero hit the post twice in a 1–1 away draw against Wolverhampton Wanderers. On 21 September, Manchester City confirmed via their official website that Agüero had signed a new contract with the club, keeping him at the Etihad Stadium until 2021. On 22 September, in his 300th appearance for Manchester City, Agüero scored the opening goal in an eventual 5–0 away win over Cardiff City. On 4 November, Agüero scored his 150th Premier League goal in a 6–1 home win over Southampton, which was his 217th Premier League appearance; he became only the ninth player in history to achieve this landmark, and only the third player after Thierry Henry and Wayne Rooney to manage this tally with a single side. He was also the second-fastest player to reach this milestone, after Alan Shearer, who took five fewer appearances. On 11 November, Agüero scored the second goal in a 3–1 win against Manchester United, making him the joint highest scorer in Manchester derbies in the Premier League era, level with Wayne Rooney). On 29 January 2019, Agüero scored within 24 seconds in an eventual 2–1 defeat at Newcastle United. On 3 February, Agüero scored a hat-trick against rivals Arsenal, including one goal within 48 seconds, bringing his Premier League tally of hat-tricks to ten, in a 3–1 win at the Etihad Stadium. On 10 February, Agüero scored his 11th hat-trick in the Premier League, as Manchester City defeated rivals Chelsea 6–0 at home; with this feat, he equalled Alan Shearer's record of 11 in the competition. The hat trick also saw Agüero overtake Tommy Johnson's and Eric Brook's record of 158 league goals for the club, and set a new record of 160 goals. The following month, he scored twice in a 7–0 (10–2 aggregate) Champions League win over Schalke and in doing so helped the club equal the record for the largest winning margin in the knockout-phase of the competition. Agüero represented Argentina at two FIFA World Youth Championships, winning back-to-back world titles. He was part of the team that won the 2005 edition in the Netherlands, alongside his future 2008 Olympics squad teammates Fernando Gago and Lionel Messi. At the 2007 FIFA U-20 World Cup, held in Canada, Agüero scored twice and helped set up three goals in a 6–0 win over Panama in the second game of the group stage of the tournament. He then scored the only goal in Argentina's third match against North Korea from a free kick. Having qualified to the round of 16, he scored two of the three goals against Poland that would eventually give them a 3–1 win to advance to the next round. Argentina defeated Mexico in the quarter-finals and Chile in the semi-finals, and faced the Czech Republic in the finals, a team they drew 0–0 in the group stage. Agüero captained and scored the equaliser in the 62nd minute, leading to a 2–1 victory. In addition, Agüero won the Golden Boot of the tournament, scoring six goals in seven, and the Golden Ball as the best player of the tournament. Agüero was named in the 23-man squad for the 2011 Copa América where Argentina had been drawn into Group A with Bolivia, Colombia, and Costa Rica. On 1 July, in Argentina's opening group stage match against Bolivia, he came on for Ezequiel Lavezzi on 71 minutes and scored an equaliser on 76 minutes to secure a 1–1 draw. On 11 July, in Argentina's third group stage match against Costa Rica, Agüero scored a goal in each half as Argentina won 3–0 and finished in second position in their group. Agüero was named in the Argentine squad for the 2015 Copa América, and in a warm-up game on 7 June against Bolivia in San Juan, he scored his first international hat-trick in a 5–0 victory. On 13 June, he scored Argentina's opening goal of the tournament in a 2–2 group stage draw with Paraguay. Three days later at the same ground, he headed a cross from Manchester City teammate Pablo Zabaleta for a 1–0 win against holders Uruguay. At the semi-final stage, Agüero headed in Ángel Di María's cross as Argentina defeated Paraguay 6–1 to reach the 2015 Copa América Final. Agüero started the final against Chile, but was replaced in the 74th minute for Gonzalo Higuaín in an eventual penalty shootout loss. Agüero was included in Gerardo Martino's 23-man squad for the Copa América Centenario and scored his first goal of the tournament in Argentina's second group match, a 5–0 win over Panama on 10 June 2016, which allowed them to advance to the quarter-finals of the competition. Agüero considered retiring from international football shortly after losing against Chile in a penalty shootout in the final of the tournament for a second consecutive time. On 14 November 2017, Agüero was taken to hospital after fainting in the dressing room at half-time in a 4–2 loss to Nigeria in a friendly match in Krasnodar, Russia. In May 2018, Agüero was named in Argentina's preliminary 35-man squad for the 2018 FIFA World Cup in Russia; later that month, he was included in Jorge Sampaoli's final 23-man squad for the competition. In his team's first group match of the tournament against Iceland on 16 June, he scored the opening goal of an eventual 1–1 draw; this was his first ever World Cup goal. In the round of 16 match against France on 30 June, Agüero scored Argentina's final goal in a 4–3 defeat, which saw his side eliminated from the World Cup. Often considered to be one of the best strikers in the world, Agüero is regarded as an all-out centre forward, but can also play as a second striker off another striker, which he often did at Atlético Madrid with Diego Forlán, due to his passing ability, tactical intelligence, and vision, which made him a capable assist-man. When asked to name the players who influenced his playing style, Agüero named former Brazilian striker Ronaldo, Lionel Messi, Ronaldinho and Diego Maradona as the best players to have played the game, but said that the player who influenced his style of play the most was “the Brazilian Ronaldo”. Aguero has a diminutive figure with a stocky build, which has led to comparisons with former Manchester City teammate Carlos Tevez and past forwards such as Romário, Del Piero, and Diego Maradona. When both were on the same team, some pundits called Agüero Tevez's heir apparent at City and others said that he was superior to his compatriot. His ex-manager at Manchester City, Roberto Mancini, has compared Agüero to former Brazilian striker, Romário, due to his pace, goalscoring ability, positioning in the area, and technique. Although naturally right footed, Agüero is also capable of striking well with his left foot, and can finish well both inside and outside the area with his powerful and accurate shot. A prolific goalscorer, Agüero's playing style is characterised by agility, acceleration and strength, being described as "sharp and clever" by former Argentine player Osvaldo Ardiles; a view which is shared by his international captain Lionel Messi, who believes Agüero possesses "immense power, strength and an incredible work ethic." Combined with his close control, quick feet, dribbling skills, and strength to keep the ball, he has been described as "a menace in the box". Despite his ability, Agüero's playing time has often been limited by injuries throughout his career. Aguero‘s regular goal celebration features in the FIFA video game FIFA 17. Agüero was married to Gianinna Maradona, the youngest daughter of Argentine footballer Diego Maradona. On 19 February 2009, Gianinna gave birth to their son, Benjamín, in Madrid. Diego Maradona was there for the birth of his first grandson, while Agüero, then 20, missed Atlético's training session earlier in the day. Atlético offered their congratulations in a statement on their official website. Agüero and Gianinna separated in 2012 after four years together. Agüero's nickname "Kun", which features on his shirt, dates back to his childhood. It was first given to him by his grandparents, due to a resemblance to the character "Kum-Kum" from the anime Wanpaku Omukashi Kumu Kumu which was Agüero's favourite television programme as a child. He stated, "I have grown to appreciate it because it's unique. It's not every day an athlete is nicknamed after a cartoon character!" Agüero has a tattoo on the inside of his right arm inscribed in Tengwar—a form of writing invented by J. R. R. Tolkien in The Lord of the Rings—that transliterates roughly to Kun Agüero in the Latin script. He also has a tattoo on his left arm of his son's name and date of birth. Agüero holds Spanish nationality, after being granted citizenship in 2010 whilst playing for Atlético Madrid. Agüero shares a close friendship with Lionel Messi, his regular roommate during outings for the national team since 2005. He described Messi as being "like a brother" in his 2014 autobiography, Born to Rise, which contains a foreword written by Messi. Messi is the godfather of Aguero's son Benjamin. Gastón del Castillo and Mauricio del Castillo are brothers of Agüero. 1 2 3 "Ficha" [Fact Sheet]. Official Site. Archived from the original on 28 January 2016. Retrieved 14 January 2016. ↑ "Champions League – Eight fantastic facts about Sergio Aguero". Yahoo Sport. Press Association. 26 November 2014. Archived from the original on 15 February 2016. Retrieved 14 January 2016. ↑ "Bio". sergioaguero.com. Sergio Agüero's Official Site. Retrieved 11 May 2016. ↑ "Sergio Agüero Player Profile - ESPN FC". www.espnfc.com. ↑ "Best goal ratios of Premier League players". Premier League. 28 September 2016. Retrieved 10 January 2018. ↑ "The best Opta Stats from Saturday's Premier League games". Sky Sports. 3 October 2015. Retrieved 6 October 2015. ↑ "Aguero: More than just a record goalscorer". BBC Sport. 2 November 2017. Retrieved 24 December 2017. 1 2 "The Rise of Sergio Aguero". BBC Sport. 7 May 2008. Retrieved 25 March 2009. ↑ Harris, Nick (20 August 2008). "Argentina 3 Brazil 0: Argentina in final after routing arch rivals – Olympics, Sport". London: The Independent. Retrieved 24 August 2011. ↑ Sergio Aguero. "Sergio Aguero on.. how he got his "Kun" nickname and what it means". ↑ Borasteros, Daniel; Casar, Alejandro (1 June 2006). "23 millones por un menor de edad". El País (in Spanish). Retrieved 15 May 2012. ↑ Castillo, Hernán (6 July 2003). "San Lorenzo, de la galera". Clarín (in Spanish). Retrieved 25 October 2015. ↑ "Diario Deportivo Olé – Pájaro de buen Agüero". Old.ole.com.ar. Retrieved 15 May 2012. ↑ "Muy frío: San Lorenzo ganó un clásico pobre – 06.07.2003". Lanacion.com.ar. Retrieved 15 May 2012. ↑ "La Crónica de Hoy | Prematuro debut, ¿el prólogo de una gran carrera?". Cronica.com.mx. 10 January 2008. Retrieved 15 May 2012. ↑ "Deportes " Torneo Clausura 2004". Terra. Retrieved 15 May 2012. ↑ "Deportes " Torneo Clausura 2004". Terra. 26 November 2004. Retrieved 15 May 2012. 1 2 3 "Biografia (Spanish)". Retrieved 20 November 2010. ↑ "Sergio Agüero, El Demonio Rojo". Independiente1905.com.ar. 13 September 2005. Archived from the original on 25 April 2012. Retrieved 15 May 2012. ↑ "Deportes > Torneo apertura 2005". Terra. Retrieved 15 May 2012. ↑ "Suma goles, suma apoyo popular – Mundial2006 – ESPN Deportes". Espndeportes.espn.go.com. 1 January 2008. Retrieved 15 May 2012. ↑ "Tres nombres que no hubieran faltado – Mundial2006 – ESPN Deportes". Espndeportes.espn.go.com. 1 January 2008. Retrieved 12 June 2012. ↑ "Agüero: todos piden por él – 15.03.2006". Lanacion.com.ar. 15 March 2006. Retrieved 15 May 2012. ↑ "Deportes > Torneo Clausura 2006". Terra. Retrieved 15 May 2012. ↑ "Agüero, el juvenil récord del futbol argentino – El Universal – Deportes". El Universal. Retrieved 15 May 2012. ↑ "Atlético agree fee for Independiente starlet". ESPN Soccernet. ↑ "Atlético sign Argentine prodigy Agüero". ESPN Soccernet. ↑ "Atlético Madrid 2–1 Recreativo Huelva". ESPN. ↑ "Marca names the Madridista captain the best player of the league". Real Madrid. Archived from the original on 30 June 2009. ↑ Lowe, Sid (3 March 2008). "A masterclass from Atlético Madrid's Sergio Agüero dented Barcelona's title hopes and made several Catalan headline-writers look very foolish indeed". London: The Guardian. ↑ "Sergio Aguero – Readers Q&A". BBC Sport. 7 May 2008. ↑ "Atletico de Madrid confirm return to Europe's elite". soccerway.com. 12 May 2008. ↑ "PSV Eindhoven 0–3 Atlético Madrid". Sky Sports. ↑ "Atletico stun Barcelona as Real close up". CNN. 1 March 2009. Retrieved 7 June 2009. ↑ "El uruguayo Forlán ganó el 'pichichi' y la 'Bota de Oro'" (in Spanish). Eurosport. 1 June 2009. Archived from the original on 10 July 2012. Retrieved 26 June 2009. ↑ "Quique Sánchez Flores and Diego Forlán prefer Sergio Agüero to Lionel Messi (Spanish)". Marca. 7 April 2010. Retrieved 18 November 2010. ↑ "Forlán double gives Atlético glory". UEFA. 12 May 2010. Archived from the original on 14 May 2010. Retrieved 30 July 2010. ↑ "Atlético Madrid 0–2 Sevilla – Match Report". London: Telegraph. 19 May 2010. Retrieved 18 November 2010. ↑ "Atletico Madrid Goal Heroes José Antonio Reyes & Kun Agüero Praise Team After Inter Win". Goal.com. 27 August 2010. Retrieved 27 August 2010. ↑ "Agüero agrees Atlético stay". Sky Sports. 4 January 2011. Retrieved 4 January 2011. ↑ "Agüero named Atlético vice-captain". Atlético Madrid Official website. 5 January 2011. Retrieved 5 January 2011. ↑ "Agüero scores in seven consecutive matches". Opta (Twitter). ↑ "RCD Mallorca 3–4 Atlético Madrid". Goal.com. ↑ "'The Time Has Come' – Sergio Aguero Asks Atletico Madrid to Tear Up His Contract » Who Ate all the Pies". Whoateallthepies.tv. Retrieved 15 May 2012. ↑ "La Hora de Partir (Time to Leave)". Sergio Agüero Official website. 23 May 2011. Archived from the original on 28 May 2011. Retrieved 29 May 2011. ↑ "Agüero: "I will not be returning to Atlético"". Atleticofans.com. Retrieved 15 May 2012. ↑ Peck, Brooks. "Atletico fans say goodbye to Aguero by wishing death upon him". Sports.yahoo.com. Retrieved 15 May 2012. ↑ "Atletico Madrid to use Aguero cash to land Porto star Falcao". tribalfootball.com. Retrieved 15 May 2012. ↑ Edwards, Luke (28 July 2011). "Sergio Aguero completes £35 million transfer to Manchester City". Daily Telegraph. Retrieved 26 October 2015. ↑ Markham, Carl (29 July 2011). "Manchester City move 'felt right' says Sergio Aguero". The Independent. Retrieved 26 October 2015. ↑ King, Dominic (28 July 2011). "£85m Aguero! Man City complete amazing deal to land Argentina striker". Daily Mail. Retrieved 26 October 2015. ↑ Bevan, Chris (7 August 2011). "Man City 2–3 Man Utd". BBC Sport. Retrieved 26 October 2015. ↑ "Top 20 greatest football debuts". Eurosport. 16 August 2011. Sergio Aguero's stunning first outing for Manchester City on Monday night – in which he scored two goals and set up another – is undoubtedly one of the best Premier League debuts ever seen. ↑ Wilson, Steve (16 August 2011). "Top 10 debuts in football to rival Manchester City's Sergio Agüero's". The Telegraph. ↑ Magowan, Alistair (21 August 2011). "Bolton 2–3 Man City". BBC Sport. Retrieved 26 October 2015. ↑ Lillywhite, Jamie (28 August 2011). "Tottenham 1–5 Man City". BBC Sport. Retrieved 26 October 2015. ↑ Magowan, Alistair (10 September 2011). "Man City 3–0 Wigan". BBC Sport. Retrieved 30 October 2015. ↑ Magowan, Alistair (18 September 2011). "Fulham 2–2 Man City". BBC Sport. Retrieved 30 October 2015. ↑ "Blackburn Rovers vs. Manchester City – 1 October 2011". Soccerway. 1 October 2011. Retrieved 30 October 2015. ↑ "Manchester City vs. Villarreal – 18 October 2011". Soccerway. 18 October 2011. Retrieved 30 October 2015. ↑ McNulty, Phil (23 October 2011). "Man Utd 1–6 Man City". BBC Sport. Retrieved 30 October 2015. ↑ Magowan, Alistair (19 November 2011). "Man City 3–1 Newcastle". BBC Sport. Retrieved 30 October 2015. ↑ Magowan, Alistair (29 November 2011). "Arsenal 0–1 Man City". BBC Sport. Retrieved 30 October 2015. ↑ "UEFA Europa League 2011/12 – History – Porto-Man. City –". Uefa.com. Retrieved 12 June 2012. ↑ "Match Report: Man City 3–0 Blackburn". Goal.com. 25 February 2012. Retrieved 12 June 2012. ↑ "Manchester City vs. Blackburn Rovers – 25 February 2012". Soccerway. 25 February 2012. Retrieved 12 June 2012. ↑ "UEFA Europa League 2011/12 – History – Man. City-Sporting –". Uefa.com. 15 March 2012. Retrieved 12 June 2012. ↑ "Match Report: Man City 2–1 Chelsea". Goal.com. 21 March 2012. Retrieved 12 June 2012. ↑ "Mystery over Sergio Aguero's 'stupid' foot injury". The Daily Telegraph. London. 31 March 2012. ↑ Reuters / PA Sport. "Premier League – 'Stupid' injury sidelines Aguero –". Uk.eurosport.yahoo.com. Retrieved 12 June 2012. ↑ "Manchester City's Sergio Agüero forced to miss Sunderland match". The Guardian. London. 30 March 2012. ↑ "Manchester City vs. West Bromwich Albion – 11 April 2012". Soccerway. 11 April 2012. Retrieved 12 June 2012. ↑ "Norwich City vs. Manchester City – 14 April 2012". Soccerway. 14 April 2012. Retrieved 12 June 2012. ↑ "Match Report: Wolves 0–2 Man City". Goal.com. 22 April 2012. Retrieved 12 June 2012. ↑ "Aguero voted Manchester City Player of the Year". Goal.com. 4 May 2012. Retrieved 12 June 2012. ↑ Jackson, Jamie (14 May 2012). "Sergio Agüero predicts 'run of trophies' for champions Manchester City". The Guardian. London. Retrieved 15 May 2012. ↑ "'Sergio was crying': Kompany relives the moments after City's last-gasp winner". Daily Mirror. 13 May 2012. Retrieved 16 May 2012. ↑ "Sun shines on City's victory parade". Reuters. 14 May 2012. Archived from the original on 13 September 2012. Retrieved 16 May 2012. ↑ Smith, Ben (12 August 2012). "Chelsea 2–3 Man City". BBC Sport. Retrieved 3 April 2013. ↑ Goss, Nicholas (19 August 2012). "Sergio Aguero Injury: Updates on Manchester City Star's Knee Injury". Bleacher Report. Retrieved 23 August 2012. ↑ Manchester City (19 September 2012). "Sergio Agüero says he would have signed for Real Madrid but was left with 'no option but to join Manchester City'". The Daily Telegraph. London. Retrieved 25 March 2013. ↑ "Man City versus Arsenal English Premier League match report – Manchester City FC". Mcfc.co.uk. 23 September 2012. Retrieved 3 April 2013. ↑ "Man City v Spurs in Premier League match report – Manchester City FC". Mcfc.co.uk. Retrieved 3 April 2013. ↑ "Man City versus Aston Villa Barclays Premier League match report – Manchester City FC". Mcfc.co.uk. Retrieved 3 April 2013. ↑ "Man City versus Newcastle in Barclays Premier League match report – Manchester City FC". Mcfc.co.uk. 15 December 2012. Retrieved 3 April 2013. ↑ "Man City away at Norwich City in Premier League match report – Manchester City FC". Mcfc.co.uk. 29 December 2012. Retrieved 3 April 2013. ↑ Press Association (5 January 2013). "Sergio Agüero confirms he has hamstring tear after tests in Italy". London: Guardian. Retrieved 25 March 2013. ↑ "Manchester City versus Fulham in the Premier League match report – Manchester City FC". Mcfc.co.uk. 19 January 2013. Retrieved 3 April 2013. ↑ "Man City versus Liverpool in Premier League match report – Manchester City FC". Mcfc.co.uk. 3 February 2013. Retrieved 3 April 2013. ↑ McNulty, Phil (17 February 2013). "Man City 4–0 Leeds". BBC Sport. Retrieved 25 October 2015. ↑ GMT (15 March 2013). "Man City's Vincent Kompany and Sergio Aguero close to return". BBC Sport. Retrieved 25 March 2013. ↑ "Sergio Aguero leaves Argentina squad". Sports Mole. Retrieved 25 March 2013. ↑ "Manchester City versus Newcastle United Premier League match report – Manchester City FC". Mcfc.co.uk. 30 March 2013. Retrieved 3 April 2013. ↑ Pitt-Brooke, Jack (8 April 2013). "Manchester United vs Manchester City: Man for man marking". The Independent. London. ↑ Purnell, Gareth (15 April 2013). "Chelsea 1 Manchester City 2 match report: Yaya Toure too strong for slow-starting Chelsea in FA Cup semi-final". The Independent. London. Retrieved 20 April 2013. ↑ Jackson, Jamie (15 April 2013). "Sergio Agüero showed his nasty side and some how escaped an FA sanction for two-footed horror tackle on David Luiz which could have ended his career". The Guardian. Retrieved 20 April 2013. ↑ Purnell, Gareth (15 April 2013). "Manchester City striker Sergio Aguero escapes retrospective action following 'seconds' of anger unleashed on David Luiz". The Independent. London. Retrieved 20 April 2013. ↑ Jackson, Jamie (17 April 2013). "Sergio Agüero apologises to David Luiz after FA Cup semi-final lunge". The Guardian. Retrieved 20 April 2013. ↑ Purnell, Gareth (19 April 2013). "Manchester City wait on Sergio Aguero and David Silva ahead of Tottenham clash". The Independent. London. Retrieved 20 April 2013. ↑ Jackson, Jamie (27 April 2013). "Manchester City 2–1 West Ham United". The Guardian. Retrieved 24 May 2013. ↑ Booth, Mark (14 May 2013). "Reading v City in the Barclays Premier League on Tuesday 14 May 2013 – Manchester City FC". Manchester City F.C. Official Website. Retrieved 26 October 2015. ↑ Ducker, James (21 May 2013). "Sergio Agüero arrives in New York but ponders an exit back to Madrid". The Times. Retrieved 26 October 2015. ↑ "Premier League: Sergio Aguero 'very happy' at Manchester City". Sky Sports. 22 February 2013. Retrieved 25 March 2013. ↑ "Real Madrid still keen on signing City striker Agüero – 'The Times'". AS.com. 21 May 2013. Retrieved 26 October 2015. ↑ Herrero, Edu (24 May 2013). "City CEO: "Agüero is not leaving"". AS.com. Retrieved 26 October 2015. ↑ Yorke, Graeme (4 March 2013). "Maradona: Sergio Aguero and Cristiano Ronaldo at Real Madrid would be spectacular". Daily Mail. Retrieved 25 March 2013. ↑ "City confirm Aguero contract extension". Manchester City F.C. Official Website. 25 May 2013. Retrieved 25 May 2013. ↑ "Sergio Aguero signs new Manchester City deal". BBC Sport. 25 May 2013. Retrieved 25 May 2013. ↑ Labidou, Alex (28 May 2013). "Sergio Aguero insists he was never interested in Real Madrid". Goal.com. Retrieved 1 June 2013. ↑ "Sergio Agüero in frame for Manchester City opener against Newcastle". The Guardian. 8 August 2013. ↑ "Man City 4–0 Newcastle – Dream start for Pellegrini as Blues batter ten-man Toon". talkSPORT. ↑ "Manchester City make easy work of lacklustre Manchester United". The Guardian. 22 September 2013. ↑ "Kun named league's best in October". Manchester City Football Club. 8 November 2013. Retrieved 10 January 2015. ↑ Simon, Nik (25 November 2013). "Forget Henry, Van Nistelrooy, Shearer and co ... this is why Aguero is now the deadliest striker in Premier League history". Daily Mail. London. Retrieved 5 March 2014. ↑ "Manchester City could be without injured Sergio Agüero for eight weeks". The Guardian. 18 December 2013. Retrieved 5 March 2014. ↑ "Sergio Aguero faces month out injured". ESPN. 31 January 2014. Retrieved 5 March 2014. ↑ "Manchester City's Álvaro Negredo inspires replay win over Blackburn". The Guardian. 16 January 2014. Retrieved 5 March 2014. ↑ McNulty, Phil (29 January 2014). "Tottenham 1–5 Man City". BBC Sport. Retrieved 25 October 2015. ↑ "Aguero's injury woes continue: Can Man City cope without their star man?". Talksport. 29 January 2014. Retrieved 5 March 2014. 1 2 McNulty, Phil (2 March 2014). "Man City 3–1 Sunderland". BBC Sport. Retrieved 25 October 2015. ↑ Corrigan, Dermot. "City sweat on Sergio Aguero injury". ESPN. Retrieved 25 October 2015. ↑ "Liverpool v Manchester City: Sergio Aguero returns to City squad for crucial Premier League meeting at Anfield". The Independent. 11 April 2014. Retrieved 22 April 2014. ↑ "Man City 3–1 West Brom". BBC Sport. 21 April 2014. Retrieved 25 October 2015. ↑ McNulty, Phil (11 May 2014). "Man City 2–0 West Ham". BBC Sport. Retrieved 25 October 2015. ↑ Booth, Mark (14 August 2014). "Aguero signs new five-year contract at City". Manchester City F.C. Official Website. Retrieved 25 October 2015. ↑ Chowdhury, Saj (17 August 2014). "Newcastle 0–2 Man City". BBC Sport. Retrieved 25 October 2015. ↑ Reich, Josh (26 August 2014). "Manchester City ominous after cruising past Liverpool". Reuters. Retrieved 30 October 2015. ↑ Bevan, Chris (18 October 2014). "Man City 4–1 Tottenham". BBC Sport. Retrieved 18 October 2014. ↑ McNulty, Phil (2 November 2014). "Man City 1–0 Man Utd". BBC Sport. Retrieved 2 November 2014. ↑ Jenson, Pete (26 November 2014). "Sergio Aguero is still coveted by Barcelona and Real Madrid... when fit he's as good as Lionel Messi or Cristiano Ronaldo". Daily Mail. Retrieved 30 October 2015. ↑ "Man City 3–2 Bayern Mun". BBC Sport. 25 November 2014. Retrieved 25 November 2014. ↑ Jurejko, Jonathan (30 November 2014). "Southampton 0–3 Man City". BBC Sport. Retrieved 30 November 2014. ↑ "Agüero scores again with FSF Player of the Year". FSF.org.uk. 2 December 2015. Retrieved 18 July 2015. ↑ "Manchester City's Sergio Aguero wins Player of the Year award in Football Supporters' Federation vote". Sky Sports. ↑ "Home | Live Scores & Latest News". Fox Sports. Retrieved 4 May 2016. ↑ "Sergio Agüero returns to Manchester City squad for Everton game". The Guardian. 10 January 2015. Retrieved 10 January 2015. ↑ "Everton 1–1 Man City". BBC. 10 January 2014. Retrieved 11 January 2015. ↑ "Last-gasp Willian strike keeps Chelsea in the clear". Special Broadcasting Services. 12 February 2015. ↑ "Sergio Aguero's penalty was the fastest in the Premier League since 1994". 101greatgoals.com. 21 February 2015. ↑ "Citizens close gap to Chelsea". Daily Star UK. 21 February 2015. ↑ "FT: Man Utd 4–2 Man City". BBC. 12 April 2015. ↑ "Manchester City beats West Ham 2–0, Tottenham Hotspur defeats Newcastle United". Australian Broadcasting Corporation. 20 April 2015. ↑ "Man City 6–0 QPR". BBC. 10 May 2015. ↑ Booth, Mark (7 August 2015). "Sergio Aguero takes no.10 shirt for 15/16". Manchester City F.C. Official Website. Retrieved 10 August 2015. ↑ McNulty, Phil (16 August 2015). "Manchester City 3–0 Chelsea". BBC Sport. Retrieved 25 October 2015. ↑ Slater, Chris (24 August 2015). "Sergio Aguero and Manchester City fans thanked for helping Everton supporter who collapsed in stand". Manchester Evening News. Retrieved 24 August 2015. ↑ Jurejko, Jonathan (30 September 2015). "Borussia Mönchengladbach 1–2 Man City". BBC Sport. Retrieved 1 October 2015. ↑ "Man City's Sergio Aguero nets five goals to match Premier League record". ESPN. October 2015. Retrieved 3 October 2015. ↑ Jolly, Richard (3 October 2015). "Sergio Aguero sets record for fastest-ever five-goal haul in Premier League". ESPN. Retrieved 25 October 2015. ↑ Bernstein, Joe (3 October 2015). "Sergio Aguero scores five goals... and Manuel Pellegrini admits the Manchester City star played with a leg injury". Daily Mail. Retrieved 25 October 2015. ↑ Richards, Alex (9 October 2015). "Aguero confirms he will miss Manchester derby after suffering muscle tear". The Mirror. Retrieved 11 October 2015. ↑ "Man City striker Sergio Aguero could miss eight weeks". Sky Sports. 10 October 2015. Retrieved 11 October 2015. ↑ Darwin, Stephen (21 November 2015). "Aguero overtakes Tevez to become highest-scoring South American in Premier League history". Goal.com. Retrieved 22 November 2015. ↑ Reddy, Luke (16 April 2016). "Chelsea 0–3 Manchester City". BBC Sport. Retrieved 16 April 2016. ↑ Chick, Alex (19 April 2016). "Sergio Aguero second-fastest to 100 PL goals, but was he offside?". Eurosport. Retrieved 19 April 2016. ↑ "Aguero hits Newcastle for six to join 100 club". Premier League. 20 April 2016. Retrieved 20 April 2016. ↑ "Tottenham's Harry Kane clinches Premier League Golden Boot". Sky Sports. 15 May 2016. ↑ "Premier League top scorer: Harry Kane? Jamie Vardy? Sergio Aguero?". BBC. 20 April 2016. ↑ Welch, Ben (13 August 2016). "Manchester City vs Sunderland live score and goal updates". Retrieved 14 August 2016. ↑ "Sergio Aguero: Foul on Winston Reid 'brutal and aggressive', says FA commission". BBC Sport. 14 September 2016. Retrieved 15 September 2016. ↑ "Manchester City 1–1 Middlesbrough". BBC Sport. 5 November 2016. Retrieved 5 November 2016. ↑ "Sergio Aguero ban excellent news for Arsenal – but terrible timing for Liverpool". 4 December 2016. ↑ News, BBC (16 September 2017). "Sergio Aguero: Manchester City striker is a 'legend' – Pep Guardiola". BBC Sport. Retrieved 17 September 2017. ↑ Bevan, Chris (12 August 2016). "Brighton & Hove Albion 0–2 Manchester City". BBC Sport. Retrieved 9 September 2017. ↑ McNulty, Phil (9 September 2017). "Manchester City 5–0 Liverpool". BBC Sport. Retrieved 16 February 2018. ↑ Jackson, Jamie (29 September 2017). "Sergio Agüero has no need to apologise for car accident, says Pep Guardiola". The Guardian. Retrieved 16 February 2018. ↑ "Sergio Aguero: Manchester City striker is a 'legend' – Pep Guardiola". BBC Sport. 16 September 2017. Retrieved 16 February 2018. ↑ Chris Bevan (21 October 2017). "'Aguero should take us all out to dinner,' jokes Guardiola after Man City defeat Burnley". BBC Sport. Retrieved 22 October 2017. ↑ Emlyn Begley (1 November 2017). "Agüero breaks record as City scores four in Naples". BBC Sport. Retrieved 1 November 2017. ↑ Critchley, Mark (20 January 2018). "Sergio Aguero hits a perfect hat-trick as Manchester City end Newcastle's acrimonious week on a sour note". The Independent. Retrieved 27 January 2018. ↑ Cooke, Richard (16 February 2018). "Aguero wins Player of the Month". Sky Sports. Retrieved 16 February 2018. ↑ Bevan, Chris (10 February 2018). "Manchester City 5–1 Leicester City". BBC Sport. Retrieved 16 February 2018. 1 2 McNulty, Phil (25 February 2018). "Arsenal 0–3 Manchester City". BBC Sport. Retrieved 25 February 2018. ↑ Jackson, Jamie (19 August 2018). "Sergio Agüero hits hat-trick in Manchester City's rout of Huddersfield". The Guardian. Retrieved 19 August 2018. ↑ Chambers, Steve (19 August 2018). "The amazing stats from Manchester City 6-1 win now throws down the gauntlet to Liverpool". The Sportsman. Retrieved 19 August 2018. ↑ Jennings, Patrick (25 August 2018). "Wolves vs Man City - BBC Sport". BBC Sport. Retrieved 25 August 2018. ↑ "Aguero extends City contract". Manchester City. 21 September 2018. Retrieved 21 September 2018. ↑ "Aguero marks new deal with goal as City thrashes Cardiff 5-0". The Washington Post. 22 September 2018. Retrieved 22 September 2018. ↑ Bryan Armen Graham (4 November 2018). "Manchester City 6-1 Southampton". The Guardian. Retrieved 4 November 2018. ↑ Harry Edwards (4 November 2018). "How does Sergio Aguero compare to other Premier League legends of the 150 club?". www.squawka.com. Retrieved 4 November 2018. ↑ "Manchester derby: Sergio Aguero matches Wayne Rooney's record as City star scores against United once again | Goal.com". Retrieved 12 November 2018. ↑ "Newcastle United 2-1 Manchester City". 29 January 2019. Retrieved 3 February 2019. ↑ "Man City 3-1 Arsenal - Aguero completes hat-trick". 3 February 2019. Retrieved 3 February 2019. ↑ "Man City 6-0 Chelsea: Hat-trick scorer Sergio Aguero your player of the match - BBC Sport". 10 February 2019. Retrieved 10 February 2019. ↑ "Sergio Aguero matches Alan Shearer's Premier League hat-tricks record as Man City thrash Chelsea". 10 February 2019. Retrieved 10 February 2019. ↑ Pollard, Rob (10 February 2019). "Aguero sets new City record". www.mancity.com. Retrieved 10 February 2019. ↑ Pollard, Rob (12 March 2019). "Manchester City equal Champions League record". Manchester City Football Club. Retrieved 13 March 2019. ↑ Brennan, Stuart (12 March 2019). "Man City break Champions League record in rampage against Schalke". Manchester Evening News. Retrieved 12 March 2019. ↑ Harris, Nick (20 August 2008). "Argentina 3 Brazil 0: Argentina in final after routing arch rivals". The Independent. Retrieved 25 October 2015. ↑ "Sergio AGUERO". FIFA. Retrieved 22 June 2014. ↑ "Super-sub Sergio Aguero rescues Argentina as Lavezzi, Tevez & Messi combination fails to ignite". Goal.com. 2 July 2011. Retrieved 24 August 2011. ↑ "Ficha del partido". Df1.conmebol.com. Archived from the original on 2 August 2011. Retrieved 24 August 2011. ↑ "Match Report | Argentina v Bolivia – 2 July 2011". Sky Sports. 2 July 2011. Retrieved 24 August 2011. ↑ "Ficha del partido". Df1.conmebol.com. Archived from the original on 14 August 2011. Retrieved 24 August 2011. ↑ "World Cup 2014: Ever Banega excluded from Argentina squad". BBC Sport. 2 June 2014. Retrieved 25 October 2015. ↑ Sanghera, Mandeep (16 June 2014). "Argentina 2–1 Bos-Herze". BBC Sport. Retrieved 25 October 2015. ↑ "Sergio Aguero and Angel Di Maria score in Argentina win over Bolivia". BBC Sport. 7 June 2015. Retrieved 7 June 2015. ↑ "Argentina 2–2 Paraguay". BBC Sport. 14 June 2015. Retrieved 25 October 2015. ↑ Fletcher, Paul (17 June 2015). "Argentina 1–0 Uruguay". BBC Sport. Retrieved 25 October 2015. ↑ Emons, Michael (1 July 2015). "Argentina 6–1 Paraguay". BBC Sport. Retrieved 25 October 2015. ↑ Luckhurst, Samuel (5 July 2015). "Copa America: Man City trio suffer defeat with Argentina as Aguero sub backfires". Manchester Evening News. Retrieved 8 August 2015. ↑ "Aguero: Several players evaluating not continuing with Argentina". Goal.com. 27 June 2016. ↑ "Sergio Aguero: Argentina striker taken to hospital after fainting in the dressing room at half-time". BBC Sport. 14 November 2017. Retrieved 14 November 2017. ↑ "Revealed: Every World Cup 2018 squad - 23-man & preliminary lists & when will they be announced?". Goal.com. Retrieved 17 June 2018. ↑ Rob Smyth (16 June 2018). "Argentina 1-1 Iceland". The Guardian. Retrieved 17 June 2018. ↑ Emlyn Begley (30 June 2018). "France 4-3 Argentina". BBC Sport. Retrieved 30 June 2018. 1 2 3 "Man City boss Mancini compares Sergio Aguero to Romario". BBC Sport. 16 August 2011. ↑ Martin Laurence (8 October 2015). "Robert Lewandowski: Is the Poland striker the best in the world?". Sky Sports. Retrieved 17 November 2015. ↑ "Ardiles: 'Aguero lives to score goals'". Talksport. 16 August 2011. 1 2 Smith, Rory (28 July 2011). "Manchester City's Sergio Agüero 'only needs a millisecond to make a difference. He is that dangerous'". The Telegraph. London. 1 2 3 Stefano Cantalupi; Valerio Clari (13 July 2007). "Aguero, classe da vendere" (in Italian). La Gazzetta dello Sport. Retrieved 22 September 2014. ↑ "Brazilian Ronaldo influenced my style of play says Sergio Aguero". Sportskeeda. Retrieved 25 August 2018. ↑ "Sergio Aguero and Carlos Tevez: Head-to-head". Manchester Evening News. 28 July 2011. 1 2 3 4 5 "Sergio Agüero's stats, News – Atletico Madrid". ESPN Soccernet. Retrieved 10 February 2018. ↑ Lowe, Sid (2 October 2006). "Aguero blows the chance to lay Atlético's derby jinx to rest". The Guardian. London: Guardian News and Media. Retrieved 28 December 2012. ↑ Smith, Rory (18 July 2011). "Sergio Aguero is heir apparent to Carlos Tevez and can write golden chapter in City's rise to riches story". The Telegraph. London. ↑ Lowe, Sid (27 July 2011). "Sergio Agüero is so much more than Carlos Tevez Mark 2". The Guardian. London. ↑ "'Incredibly good value': Ossie Ardiles gives his verdict on new Manchester City signing Sergio Aguero". Manchester Evening News. 29 July 2011. ↑ "Aguero is 'incredible' and will spark City, insists Barcelona superstar Messi". Daily Mail. London. 14 August 2011. ↑ "Manchester United's Paul Pogba dab, Arsenal's Mesut Ozil dummy and the best FIFA 17 celebrations". Evening Standard. Retrieved 11 October 2018. ↑ Elkington, Mark (19 February 2009). "Maradona a grandfather thanks to Atletico's Aguero". Reuters. Retrieved 30 October 2015. ↑ Fitzgerald, Todd (4 January 2013). "Manchester City's Sergio Aguero splits from wife of four years". Manchester Evening News. Retrieved 28 March 2015. ↑ "Yes you Kun! New City star Aguero told he can use nickname on his shirt". Daily Mail. 18 August 2011. Retrieved 30 October 2015. 1 2 "The rise of Sergio Aguero". BBC Sport. 7 May 2008. Retrieved 30 October 2015. ↑ "Sergio Agüero Tattoos". Vanishing Tattoo. Retrieved 5 June 2009. ↑ "Aguero gains EU status". Sky Sports. 3 December 2010. Retrieved 30 October 2015. ↑ Smith, Ben (8 November 2014). "Sergio Aguero: Man City hero's journey from the 'cave of vipers'". BBC Sport. Retrieved 30 October 2015. ↑ Maston, Tom. "Extra Time: Aguero delivers gift for Thiago Messi". Goal. Retrieved 12 October 2018. ↑ "Aguero spotted watching brother Mauricio del Castillo's debut". Marca. 3 September 2016. Retrieved 16 March 2018. 1 2 3 4 "S. Agüero – Soccerway Profile". Soccerway. Retrieved 17 December 2015. ↑ "Games played by Sergio Agüero in 2002/2003". Soccerbase. Centurycomm. Retrieved 9 August 2015. ↑ "Games played by Sergio Agüero in 2003/2004". Soccerbase. Centurycomm. Retrieved 9 August 2015. ↑ "Games played by Sergio Agüero in 2004/2005". Soccerbase. Centurycomm. Retrieved 9 August 2015. ↑ "Games played by Sergio Agüero in 2005/2006". Soccerbase. Centurycomm. Retrieved 9 August 2015. ↑ "Games played by Sergio Agüero in 2006/2007". Soccerbase. Centurycomm. Retrieved 9 August 2015. ↑ "Games played by Sergio Agüero in 2007/2008". Soccerbase. Centurycomm. Retrieved 9 August 2015. ↑ "Games played by Sergio Agüero in 2008/2009". Soccerbase. Centurycomm. Retrieved 9 August 2015. ↑ "Games played by Sergio Agüero in 2009/2010". Soccerbase. Centurycomm. Retrieved 9 August 2015. ↑ "Games played by Sergio Agüero in 2010/2011". Soccerbase. Centurycomm. Retrieved 9 August 2015. ↑ "Games played by Sergio Agüero in 2011/2012". Soccerbase. Centurycomm. Retrieved 9 August 2015. ↑ "Games played by Sergio Agüero in 2012/2013". Soccerbase. Centurycomm. Retrieved 9 August 2015. ↑ "Games played by Sergio Agüero in 2013/2014". Soccerbase. Centurycomm. Retrieved 9 August 2015. ↑ "Games played by Sergio Agüero in 2014/2015". Soccerbase. Centurycomm. Retrieved 9 August 2015. ↑ "Games played by Sergio Agüero in 2015/2016". Soccerbase. Centurycomm. Retrieved 16 August 2015. ↑ "Games played by Sergio Agüero in 2016/2017". Soccerbase. Centurycomm. Retrieved 13 August 2016. ↑ "Games played by Sergio Agüero in 2017/2018". Soccerbase. Centurycomm. Retrieved 10 February 2018. ↑ "Games played by Sergio Agüero in 2018/2019". Soccerbase. Centurycomm. Retrieved 27 January 2019. 1 2 "Agüero, Sergio". National Football Teams. Benjamin Strack-Zimmerman. Retrieved 10 February 2018. 1 2 3 "Sergio Agüero: Overview". Premier League. Retrieved 8 March 2019. ↑ "South American Team of the Year". 16 January 2009. Archived from the original on 21 January 2015. Retrieved 10 March 2015. ↑ "Manchester City hope to sign Sergio Aguero with record Premier League transfer bid". Telegraph. 2 November 2008. Retrieved 6 March 2015. 1 2 "AWARDS". FIFA.com. Retrieved 2 February 2015. ↑ "Sergio Agüero, Golden Boy". Aguero10.com. Archived from the original on 9 June 2011. Retrieved 24 August 2011. ↑ ""World Soccer" Awards". Retrieved 21 November 2015. ↑ "City Live: Aguero named Etihad Player of the Season". Manchester City FC. Retrieved 6 August 2015. ↑ "FifPro announces reserve Teams of the Year – but Luis Suarez and Arjen Robben won't be laughing while Iker Casillas is somehow named the second best goalkeeper of 2013". Independent.co.uk. 15 January 2014. Retrieved 1 October 2017. ↑ "2015 World XI: the Reserve Teams – FIFPro World Players' Union". FIFPro.org. 11 January 2016. Retrieved 1 October 2017. ↑ "FIFA FIFPro World XI: the reserve teams – FIFPro World Players' Union". FIFPro.org. 15 January 2015. Retrieved 1 October 2017. ↑ "Manchester City's Sergio Aguero picks up Football Supporters' Federation Player of the Year". Daily Mirror. 1 December 2014. Retrieved 1 December 2014.